My wife was going through a pile of papers yesterday and found a dungeon map key that my son had made some time ago. 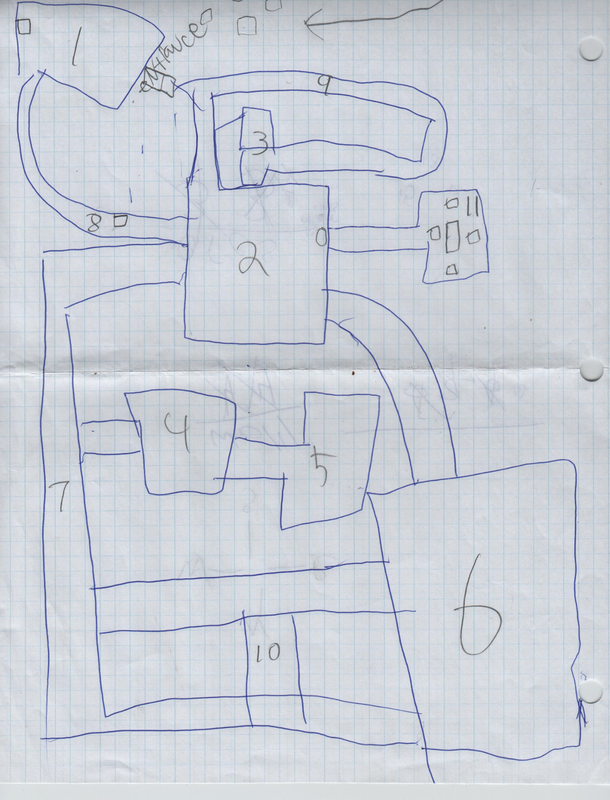 I went through some of my Whitebox campaign notes and found what I think is the corresponding map, at least it has the same number of rooms and the pit trap is drawn next to the right key number. 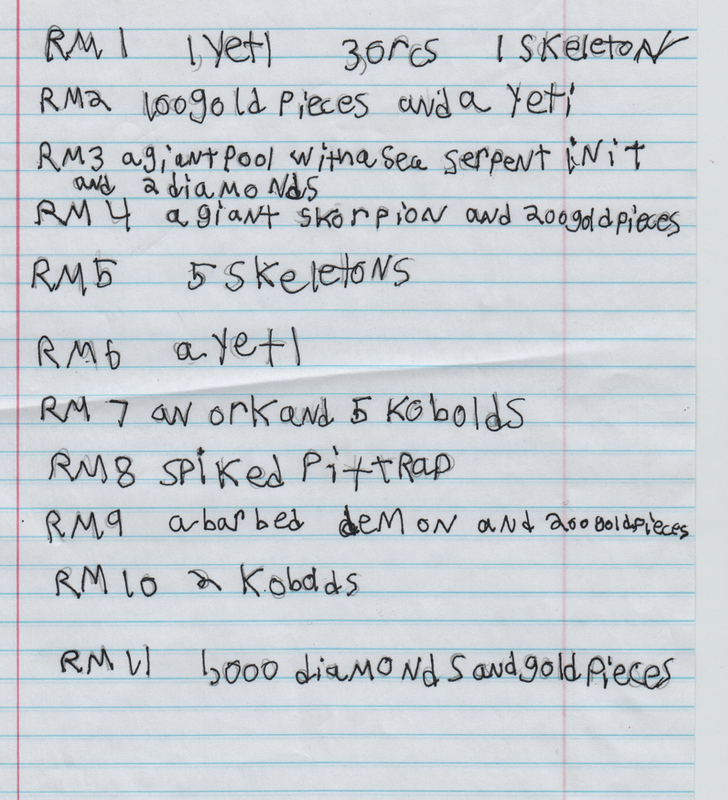 It was probably about four years ago, as it was shortly after this that I gave my kids the tip of choosing monsters close to the challenge level of the party, and you can see this has no such constraints – Sea Serpents, Demons and Yetis cohabit equally with Orcs and Kobolds! When we first started playing, I told the kids to just pick monsters that they liked from the Swords & Wizardry Monster Book (Word doc). They would create adventures and take turns DMing for me and for each other. Of course at that point I was just happy they wanted to play at all, so I tried to encourage whatever creativity they showed. I have some old maps they drew, but for some reason none of them have the corresponding keys, this is the first map key to turn up. Below is the corresponding map. Our games are less frequent now as the kids are into Minecraft and other video games, so this brings back some fond memories. Coolness! That does sound like a fond memory. Hopefully, they come back to paper and pencil roleplaying soon. Definitely keep that map and key! Yep, it was my own memories of playing as a kid that brought me back to it some 20 years later, so hopefully it sticks in some form. I played until I was 18 or so, and my son is 13 now – but there were fewer electronic distractions back then. I’m twelve, and I still write for D&D, in fact, I have a blog where I put my stuff up, and I DM on Roll20. It’s too bad that your children stopped playing D&D, however I like Minecraft as well! (And it brings out creative energy). Actually, I got an idea for a dungeon from Minecraft. Thanks for the comment. I’m hoping it’s just a phase and I can get them back into tabletop RPGs at some point, but for now they continue to prefer computer games. I’m impressed that you’re DMing and blogging at 12, keep it up! That’s about the age I and most of my generation got started with D&D, so it’s good to hear.